Get the most romantic proposal for your loved one ! Are you visiting Europe with your honey ? Since, you’re on the romantic continent, why don’t you take the opportunity to make this trip a once-in-a-lifetime experience by proposing just here ? 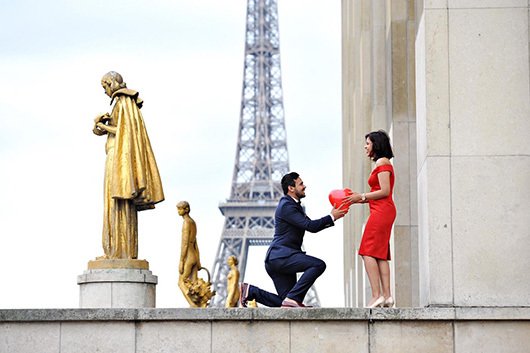 You’re sure to get an amazing moment for an awesome proposal. surprise your wife or husband-to-be with a proposal. Why can we help you with? Well, even if you want this to be a surprising, intimate moment, you also want it to be perfect, and end up with a yes ! Planing such an event in a distant country with the language barrier on top of that can be a little overwhelming. Our team at Love Gracefully is fluent in French, English, Italian, and Spanish. And they are all natives ! Meaning that they know the very best places to offer you to set this very unique life decision you are about to make with the one you love. But you also want this once-in-a-lifetime moment to be set in stone, or rather in films. That’s why we can offer you great photographers to witness this proposal. We have been working with them for over a decade now, and they have provided stunning pictures, capturing both the unique setting and the unique feeling of this moment. A proposal is a surprise you don’t want to overlook the preparation of. Because all you want to get is a yes, we will help pave the way for that final answer. 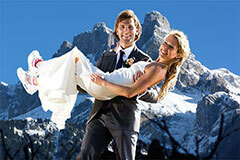 Our packages for proposals start off at 450 euros. The basic offer includes a 1-hour photo shooting in a location set in advance. In Paris, this could be the iconic Eiffel Tower or Notre-Dame cathedral. These are classic, but the photos you can get there are just wonderful and will make great save-the-date cards. Rome,Italy, also offers plenty of great spots for this photo shooting. The Colosseum backdrop is one of our favorite. 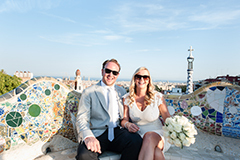 And in Barcelona, Spain, you might want to have a proposal right on the beach to soak up the Mediterranean vibe. We are here to help you decide where would be the best place for you to propose. You can be sure your honey won’t expect it! A slight drawback though is that you might not be dressed up properly for the occasion as you will just be randomly strolling around the city (or so it will seem). That’s why option 2 is a pre-booked photo shooting session. You and your loved one will then have to be dressed up in a classy attire for the occasion. We’ll agree on a shooting location, and within the session, you will be able to pop up the question ! A little less surprising here, but easier to plan and stunning pictures ahead! The way we work has proven efficient : we want to get to know you so that we are able to envision what a dreamlike ceremony could be for you. That means we will be in close touch with you from the beginning through phone calls, emails and Skype sessions. Would you have any questions, we will get back to you within a day. We want this moment to be stressless, flowing, personal and just fantastic! With over 10 years experience in love celebration at Love Gracefully, we know how to offer you the best helping hand to design this very special moment. That choice it up to you, but we are here to debate it with you and help you find the best solution fitting your very needs. Would you wish a more elaborate scenario or setting, we could work on something with you beforehand. That could include a candle-full space, a dog randomly bringing the ring on his collar or anything of your fancy. We will be happy to create a very special concept with you for your proposal. Feel free to contact us to know what we could do and for what price.